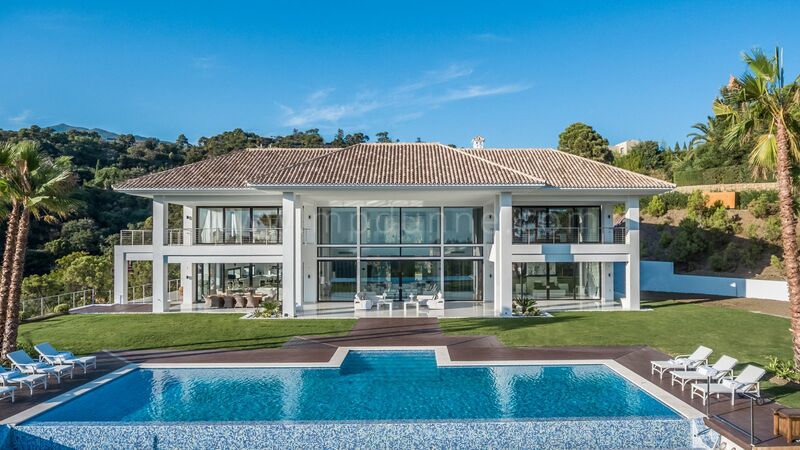 This magnificent mansión is located in the exclusive residential area of La Zagaleta Golf & Country Club, a safe and secure environment with 24 hour security set in a tranquil area and home to many luxury villas and mansions. The area is set within beautiful natural surroundings with fantastic sea and country views. The golf course is close by and San Pedro, a busy spanish town is a short drive as are the beautiful Sandy beaches. Puerto Banús is also a short drive away. This superb well appointed mansion is newly built and designed in a contemporary style with a huge built area of approx. 1,700m2. The distribution is over three levels including an elevator to each floor. The property enjoys a spa and leisure zone with a feature indoor heated pool, large gymnasium, spa, movie room, snooker table and a stylish wine cellar and bar. The property is built to high quality specifications and enjoys magnificent south orientation sea views from most rooms. The property is accessed through automatic gates and through a long majestic driveway to the courtyard and entrance. Through the impressive main entrance door this leads into a hallway with feature glass stairs to access the two other floors and onto a formal drawing room with double ceilings and door to ceiling windows which create a sense of space and light between indoor and outdoor living. Here also is a gas fireplace and from here it leads to the huge family kitchen and dining area which can seat up to 18 people and a lounge area with wall mounted televisión. To the left of the entrance hall is a smaller hallway leading to a guest toilet, the elevator and two large double bedrooms with en suite bathrooms, one of which includes a dressing room. On the upper floor the rooms are accessed through a gallery which is currently used as an office but this has an en suite bathroom which can easily be converted into an additional fourth bedroom suite. This floor has 2 double bedrooms with en suite bathrooms, one of which has a dressing room and the handsome master suite with spacious twin dressing rooms and a large en suite bathroom with free standing bath and walk in shower. The lower floor is bright and airy with feature windows in all rooms and provides a guest suite, 2 bedroom staff quarters with own entrance, an 8 car garage and the prívate spa and entertainment area. Outside the property are covered entertaining areas with direct access from the villa which enjoy views over the outdoor infinity pool with decking surrounds. The huge grounds of around 3,750 m2 include manicured lawns with mature vegetation and Japanese flower beds.